A rendering of one of the new station stop designs that will vary with ridership level. 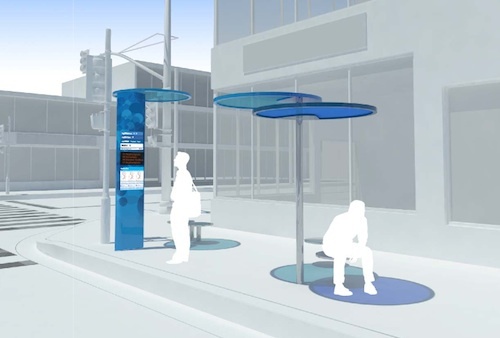 This week the Santa Monica city council authorized the city manager to award contracts for the installation and maintenance for the Big Blue Bus Shelter Redevelopment Program, bringing us close to implementation of a process that has dragged on for far too long. This plan to update and modernize bus stop facilities and extend amenities to more locations goes to discussions at least as far back as 2007. I still recall seeing renderings and promises in the papers many years ago, and before I was much involved in transit advocacy, that just never materialized. This whole saga has been illustrative of a what happens when fixation on customized design aesthetics and branding vanity comes at the expense of transit users who have to wait around for years to get any improvements. In those earlier council reports you can find there was clearly discussion of using out of the box modular designs that could be aesthetically pleasant with at least some customizable options. Such options would have been functional and cheaper both to install as well as maintain or modify in the future. However the decision was made to go down the path of highly customized station shelters to be quite uniquely Santa Monica and Big Blue Bus, and now more than half a decade later we still don’t have anything tangible to show for the effort yet. Back when the new shelter plans with more bus time displays were first conceived, smart phones and transit apps were not quite as ubiquitous, but now that they are so many years later, expediting open access to the data for phone apps might reach more Big Blue Bus users. There is value to having real time data built into stops, especially those at peak locations, since not everyone has a smart phone, but the landscape of transit navigation has been changing quickly during all these years of delays. The contracting moving forward is for $7.3 million dollars, and will not complete the full extent of original plans, which will have to wait for additional funding. One of the more recent of many complications that had set back moving forward was the reliability of plans for off the grid solar PV at the shelters to power real time transit displays. The displays will instead now be hooked to the same power connections traffic lights depend on. Many Big Blue Bus stops have no near by shade cover at all right now, which can be hot with high UV exposure on the sunniest days (and most delayed buses). Though rainy days are few, they come reliably every year and that inevitably should not be exuded from designs for transit shelters in Southern California. At the end of the day, what matters perhaps most of all is improving service frequency and on time performance (which the agency has admitted as poor recently with unusual candor). We really want people to be waiting for as little time as possible. Let the experience of Santa Monica be a cautionary tale of how not to manage bus stop facility improvements. Hopefully it won’t be too much longer before we actually see some of these updates, but I won’t be surprised if once implemented the custom discs and other features fall short on functionality in the pursuit of a branded “cool” aesthetic. Bus benches and shelters can often become very political, caught up in NIMBYism etc. L.A.’s shelter program is a mess, as I alluded to in comments in re my interview regarding the new bench contractor. BYW, I just spotted new metal benches at the Wilshire/Santa Monica Blvd. Rapid stops. Does this mean Beverly Hills will soon replace those hideous antiquated wood benches? While the bus shelter project has been a disaster for BBB, the real embarrassment is that the city that hosts Google and Yahoo! amongst other tech firms cannot seem to figure out how to make real time bus info available online and via mobile platforms. BBB is the largest bus agency in LA County that doesn’t have real time bus arrival info. It’s time (pun intended!) for BBB to get on board with this simple enhancement that will be the most meaningful improvements to everyone that uses its service. They have a godawful embarrassment of a website they just rebuilt. It’s pathetic.